Miki is just about to sign her name to the resignation letter when she gets a call from her mother telling her that she has just deposited Miki’s first paycheck into the bank. Miki’s mom broke down a bit and said how happy and proud she was of Miki and the hard work she did to earn the money to help her little sister. This makes Miki cry and she decides once more that she will continue on for the sake of her family. She wipes away her tears, puts the resignation, unsigned, into her desk and joins the group meeting. Her coworkers are outraged that she has the gall to come back and join them when she should just quit. Tachibana looks less than thrilled that Miki is still around and shoots an evil death glare her way. How can no one see this about her? Meanwhile, at a company meeting, the higher ups are furious about the soybean scandal. It seems as if all the responsibility is being thrown on Bando. A worker near Nakahara says that it is Anzai’s time to shine now that Bando is slipping and fallen into disgrace. This makes Nakahara feel worse as he gave the information to Anzai, not knowing his true intentions. After both meetings finish, Miki is walking towards her desk and almost passes out. Kirino manages to catch her before she falls. He asks if she is all right, and she replies that she is fine and goes back to her desk. I think Kirino knows that she is not fine (he pretty much knows she’s persona non grata within her department). Nakahara again tries to seek out Anzai just to learn he is at a different branch office talking with other heads. On her way home, Miki again nearly passes out. This time she collapses to her knees. It seems all the stress is finally affecting her physically. As she is recalling all of her coworkers telling her to quit, she digs out her phone and calls Nakahara. She goes to his apartment where he happily runs out to meet her. Once inside, Nakahara gives Miki the key to his apartment and says she is welcome any time. She asks him if he really meant that no matter what he wants to be with her forever. Nakahara says that he did mean it and Miki asks if he would still like her if she decided to quit working at AOI. This surprises Nakahara (then again, he doesn’t know how badly she is being treated). He tells Miki that he really likes the her that is trying her best and going forward. He then says that everyone has a time at their job where they are unsure if they’re doing the right thing or making a difference, so she should do her best and stick it out. This does little to comfort Miki. In fact, the happiness she felt when she was with Nakahara fades a little, but he helps her recommit to sticking it out at the company. At home, Ai brings up quitting school since she has to take a year off anyways. Miki is immediately against the idea. Ai says that she’ll be a year behind her friends, plus she doesn’t want to be a burden. Miki tells her not to be in a rush to go out and work and to finish her schooling. She adds that she has never once thought of her beloved little sister as a burden. Ai then angrily says that Miki can’t possibly understand how she feels and leaves. Really? Miki understands more than Ai can possibly think. All Miki wanted to do when she graduated was to start working at a company, but that dream has turned into a nightmare. When Tachibana and Miki arrive at work, it is teeming with reporters for the press conference regarding the genetically altered soybeans. Bando and the president only bow their heads and apologize without answering any questions. This infuriates the media who believe that an apology is not enough. Nakahara is watching, eaten by guilt and Kirino is watching, worried over his good friend and colleague Bando. Nakahara leaves the press conference only to run into Bando who pats him on the shoulder and tells him good luck. Ah, nothing like unintentionally rubbing salt into Nakahara’s gaping wound of guilt. Kirino always seems to be present at these moments, silently observing everything. I think he pretty much knows that Nakahara is involved in the soybean scandal without being told. Miki gets to the office and Sano hands out call manuals to handle complaints. It will be the department’s job to help deal with the angry callers. Miki wishes Nishijima being rude to one of the callers and she then answers the phone only to have the same caller, now angry with her because of Nishijima (he really isn’t a people person). Umezawa comes out and calls Suzuki to come to a meeting. Sano grabs her stuff and goes to leave as well only to be told that she wasn’t needed and can stay behind and wait for Suzuki to fill her in. Ouch. Great way to make her feel bad and put Suzuki in an awkward position. Nakahara jumps in front of Anzai’s car, effectively stopping him. Anzai wants to know what’s up and Nakahara brings up the soybean scandal. Anzai then asks what Nakahara wants for his help. This stuns poor Nakahara. He didn’t do it for personal gain, nor did he do it to help Anzai launch a sneak attack against the president and Bando. Nakahara tells Anzai that if he had known how the information was going to be used, then he would never have helped him. Sheesh. Nakahara should have known better to begin with. He’s just as naive as Miki in many ways. Suzuki asks was Sano was excluded and Umezawa says that is because she is disliked wherever she goes because of her tense personality. Sano then proceeds to take her anger out on her workers, in particularly Miki. She sends Miki and a few others to one of the warehouses for the companies they sold the soybeans to in order to go through the stock and check the products for the ones that might have the genetically altered product. While Miki and three others leave for the warehouse, Tazawa emails Tachibana with a link showing her putting the wallet into Miki’s bag. This seriously shocks and upsets Tachibana. She tears through the office trying to find the hidden cameras. Tazawa is on his laptop in the bathroom again. 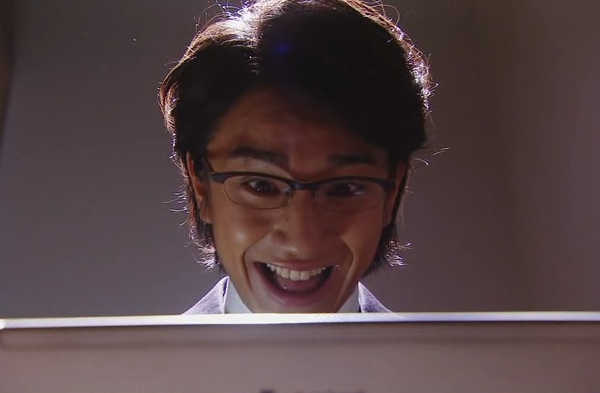 He is watching Tachibana run around like a chicken with its head cut off, laughing to himself. He is seriously creepy. I don’t know what to make of him. Tachibana finds one of the cameras and then says they are going to be great friends. This in turn freaks Tazawa out. He didn’t expect her to find the cameras, nor know that it was him who placed them. At the warehouse, Nishijima and Miki are in charge of carting out the bags of soybeans for transportation while the other two girls check them against their lists. 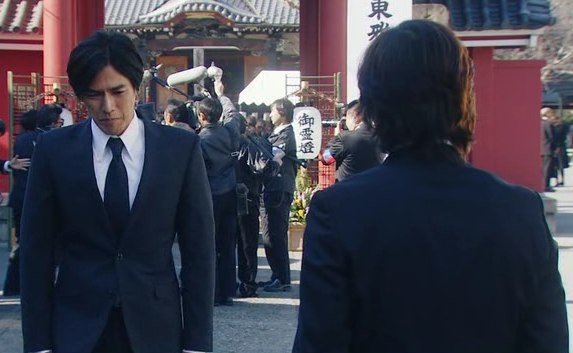 Miki notices that Nishijima is fairly dripping with anger. He nearly gets hit by a skidster and a bag of soybeans falls off and rips open. Miki goes to help him pick up the mess and Nishijima picks up soybeans and throws them at her. He blames her stupidity for the reason he’s stuck doing such a task. He tells her to hurry up and quit. The other two echo his sentiments. Seriously, this problem has nothing to do with Miki this time. Tazawa and Tachibana join forces!? It is nighttime and Tachibana is still at the office. Walking down the hall, Tazawa notices her and rushes at her, grabbing her, dragging her into a conference room and holding her down on a table. He says that she’s been caught and he has the proof. Tachibana asks what proof. She then spins a story that is unfortunately plausible. All she needs to say is that she thought the wallet was Miki’s and she was just putting it safely back in her bag. She would have admitted it earlier, but was embarrassed that it got blown out of proportion. She then tells Tazawa that his proof will only get him into trouble as he has been filming the office all of this time. Tachibana then turns the tables on Tazawa and slams him into the table. She asks how many cameras he has installed. Tazawa sets up his laptop and Tachibana goes through the footage, seeing where Nakahara took information off Miki’s computer. The more she watches and changes cameras, the more she smiles. Tazawa watches all of this with a smile of his own. Hmm, I knew he was twisted, but I didn’t think he was on Tachibana’s level. Drat, she doesn’t need anyone else to help take down Miki, she’s doing a good enough job on her own. An upset Nakahara calls Miki to talk, but she is still working at the warehouse. All alone. Looks like her coworkers abandoned her to finish by herself. He asks if she’s still working and she says that she is. He apologizes for calling her while she is working. She replies that is fine and that she is doing her best and working hard. She apologizes for the previous night and talking about quitting. Nakahara hangs up. Looks like that wasn’t enough of a Kyuu-chan injection to make him feel any better. Nakahara goes to head into his apartment only to be stopped by Tachibana. She says that she knows what he’s done and how it must be really hard on him. She says that she will always stand by and support him. A nice sentiment if she wasn’t a crazy stalker. Tachibana knowing that he is involved with the soybean scandal surprises Nakahara, but I think he finds some small comfort in that fact that she knows, but still supports him. The next day, a reluctant Miki gets up and goes back to the warehouse where she runs into Bando who was trying to get in to personally apologize to the company’s president. Miki introduces herself and says that she is disappointed that things turned out in such a way. Bando follows her to the warehouse where he sees how much work she has to do all by herself. Meanwhile Suzuki says that he will be going to Italy, angering Sano who wants her chance as well. Suzuki says she should change and be more open, maybe find a different job. Sano says she’s worked too hard to kiss up to a person who’s been there less than she has and she won’t change her job now. She then goes on an emergency drinking binge after the meeting. Bando rolls up his shirt sleeves and helps Miki take care of the soybeans. Miki asks him what will happen to them and he says they will probably all be destroyed. Miki says that it is such a waste. Bando then says he watched these plants grow up and it’s disappointing that someone’s ill will has led to this. Bando then invites Miki out for dinner. He then says that Miki just starting out means she is either in heaven or hell. Miki admits to having wanted to quit. Bando says that as her sempai, he has one piece of advice to give her: hold on and keep working. If you do, that time will surely become your life’s treasure. A nice sentiment from Bando. While they are getting ready to eat, Kirino comes in who is surprised to see Bando with Miki. Bando says that he always would treat the young workers and Kirino says he remembers. Kirino then says he will do his best to help Bando out of the situation. Bando thanks him, but says that it is best if the blame his placed on his shoulders. It won’t do the customers any good to learn that this whole scandal was the result of corporate infighting. Afterward, Kirino walks Miki home. He says that Bando was a big help and encouraged him when he was uncertain and just starting out. He then gives Miki a warning to be careful. Miki wonders what he means, but Kirino doesn’t explain. The next day on the way to work Miki sees the front page story of a newspaper is a report of Bando committing suicide. This shocks Miki who was just with him the other day. She then rushes to the company looking for Kirino. She goes to his office and is told by one of her coworkers that Kirino has already left. Miki rushes to the roof to find Kirino. He is pulling out a cigarette to smoke when he has a flash of Bando standing next to him and smiling. Kirino breaks down and cries for his lost friend. Miki silently watches over him, distressed but unable to help. She goes back down to the office where she recalls all of Bando’s advice and his warmth. She met him only briefly but she mourns his passing. At Bando’s memorial, Nakahara stands frozen outside. He sees the reporters who swarm like vultures. Bando’s suicide is basically an admission of guilt on his part. 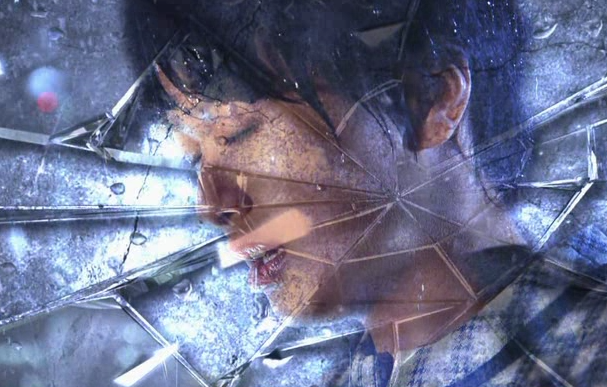 Nakahara is greatly aggrieved as he believes that its all his fault that his mentor committed suicide. He turns to leave only to run into Kirino who asks if he isn’t going to stay for the service. Nakahara says that he is the one that drove Bando into a corner. Kirino says that it is not Nakahara’s fault, that anyone in Nakahara’s position would have done the same thing. This does not comfort Nakahara who leaves. Meanwhile, Miki is working hard at the warehouse to finish up the soybean sorting. Tormented Nakahara tries to call her to talk, but her phone is on vibrate in the other room so she doesn’t hear it. Thus Nakahara goes drinking. Nothing like drowning misery in alcohol. He gets completely wasted and stumbles his way back to his apartment. Arms wrap around him from behind and Nakahara calls out Kyuu-chan’s name. But it’s not Kyuu-chan, it’s Tachibana. She holds him and says that he is someone she shouldn’t love. She has tried hard to distance herself from him, but just can’t hold back any longer. Yeah right. The girl is stalking him and using every trick in the book to get her hooks into him. But she does display an oscar winning performance. Nakahara keeps crying and calling out “Kyuu-chan.” After Miki finishes up at the warehouse, she sees that she missed Nakahara’s calls and she tries calling him back only to get no response. She then recalls his depressed mood from the past few days and she rushes off to his apartment. She knocks, but there is no reply. She lets herself in and sees his clothes strewn on the couch. She goes into the bedroom to see him sleeping. she turns and there is Tachibana in a towel! Tachibana has a victorious little smile on while she apologizes. The shocked Miki runs out of the apartment and keeps running. One of the bags she’s carrying breaks, strewing papers all over the sidewalk. She begins picking them up when it starts pouring rain. Frustrated, Miki throws the papers to the ground and says she has nothing left. She then rushes to the rooftop at AOI company repeating to herself over and over that she has nothing. She gets up on the edge of the roof and . 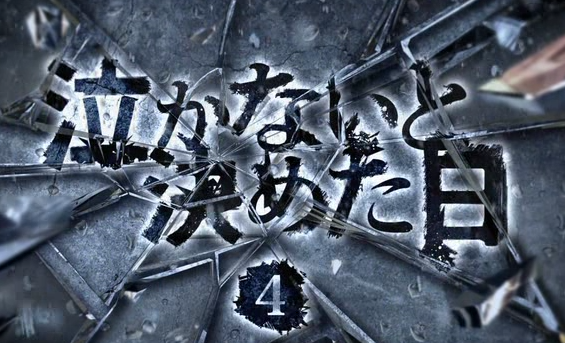 . . we don’t get to see what happens next as that’s all to episode 4. A cliffhanger, but not really, because like I said, she is our protagonist so they won’t be killing her off, at least not yet. My thoughts: I was surprised at Bando’s suicide. For a person to say you need to hold on, wasn’t that just letting go? Bando did say everyone holds on in different ways, but I don’t see suicide as holding on to anything. I am sick of Tachibana and her scheming. The crazy wench needs to go and she can take Tazawa with her. His character was okay to me, a little weird, but okay. If he really is joining forces with the psycho-Tachibana, then I am predisposed to hate him now. I am liking Naohito having more screen time. I absolutely loved him in Hotaru no Hikari (and am looking forward to the second season staring in July) and am happy to be able to see him in this drama. I really wished we knew the reason as to why he always seems so dour and depressed. But him having more screen time means that he’s going to become integral to Miki in some way (previews show him saving her from jumping). Ah, what will happen next in this screwed-up-but-addictive-drama? I know, right? I get extremely frustrated at the over-the-top antics at times, but can’t help myself from wanting more. It is highly addictive and the leads do a great job. Who knew Anne could play such a psychotic person so well and after Mei-chan, it’s odd seeing Eikura Nana as a person who is easily bullied and doesn’t stand up for herself, but she definitely does a good job in the role. It is a bit extreme. It’s like all the bullying in the dorama “Life” was escalated and transferred into the workplace. And it is odd seeing Eikura Nana playing that role (though I haven’t seen Mei-chan) because she’s usually been in bright, happy dramas before. But she and Anne are really selling the story. I haven’t seen life, but have heard stories about the bullying. I highly recommend Mei-chan it’s a silly little dorama, but I must admit to liking it. Plus it has Sato Takeru, Mizushima Hiro, and Mukai Osama, Oomasa Aya, and Iwasa Mayuko in it. More reason’s to watch it. I got into the live action much better than the manga. Having watched the first four episodes, I can’t wait to see what Crazy Anne is cooking up with Tazawa whose character, I must admit, confuses the heck out of me. Yeah, Tazawa is a bit of an oddity. Not sure what his motives are but it might become more clear by the next episode. For now, it looks like an unholy alliance, that’s for sure. Crazy stalker girl + creepy office dude who’s into voyeurism… I guess we’ll just have to wait and see.